Note: Sugar Free Flavors come in 3lb bags. Preparation for Sugar Free flavors requires less powder per 8oz drink than regular flavors. Also available in single serves and retail canisters. Tiger Spice: Creamy, rich tasting black tea blend enlivened with the exotic bite of freshly ground organic spices. Tiger Spice Decaf: A decaffeinated version of Tiger Spice Chai made with premium decaffeinated black tea. Elephant Vanilla: Premium Madagascar vanilla known for its pure, clean flavor. Tortise Green Tea: Green tea carefully balanced with the spiciness of cinnamon and cardamom; allows true green tea essence to shine through. Orca Spice Sugar Free: A sugar-free, low-calorie version of Tiger Spice Chai with the sugar replaced by Splenda (sucralose). Flamingo Vanilla Decaf Sugar Free: A sugar-free & decaf version of our Elephant Vanilla chai uses decaffeinated black tea with the sugar replaced by Splenda (sucralose). White Shark: White tea chai combines quality Bai Mudan white tea and organic spices. It evokes gentle notes of citrus and a bite of black pepper. 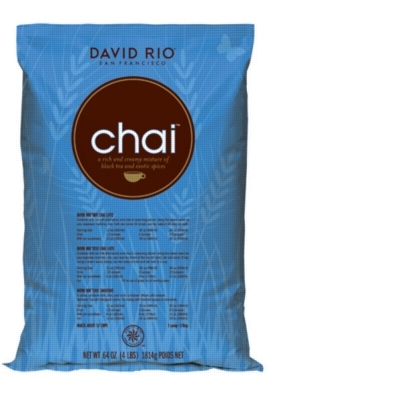 Hot Chai Latte: Place 2-3 Tbs of chai in a cup (add more or less to taste). Add 7oz of hot water, milk, or milk substitute. Mix well and enjoy. Iced Chai Latte: Dissolve 2-3 Tbs of chai in 2-3oz of hot water, milk, or milk substitute. Add 1/2 cup of cold water, milk, or milk substitute, and pour over ice. Stir and Serve. Ice Blended Chai Frappe: In a blender, place 1/2 cup of milk, 5 Tbs of chai, and 1 cup of ice. Blend on high speed for about 30 seconds and serve. INGREDIENTS: cane sugar, coconut oil, corn syrup solids, honey granules, black tea powder (4 %), vanilla (2 %), sodium caseinate (a milk derivative), natural spice blend, natural flavors, ground cinnamon, emulsifier (mono- and diglycerides), stabilizer (dipotassium phosphate), emulsifier (soy lecithin). INGREDIENTS: maltodextrin, coconut oil, decaffeinated black tea powder (7%), sodium caseinate (a milk derivative), emulsifier (mono- and diglycerides), stabilizer (dipotassium phosphate), natural spice blend, emulsifier (soy lecithin), sucralose, natural flavors, salt. INGREDIENTS: cane sugar, creamer (coconut oil, corn syrup solids, sodium caseinate [a milk derivative], mono and diglycerides, dipotassium phosphate, soy lecithin), honey granules, decaffeinated black tea powder, natural spice blend, natural flavors. INGREDIENTS: maltodextrin, coconut oil, black tea powder (7 %), sodium caseinate (a milk derivative), emulsi- fier (mono- and diglycerides), stabilizer (dipotassium phosphate), natural spice blend, emulsifier (soy lecithin), sucralose, natural flavors, salt. INGREDIENTS: cane sugar, coconut oil, corn syrup solids, honey granules, black tea powder (4%), sodium caseinate (a milk derivative), natural flavors, ground cinnamon, natural spice blend, emulsifier (mono- and diglycerides), stabilizer (dipotassium phosphate), emulsifier (soy lecithin). INGREDIENTS: cane sugar, coconut oil, corn syrup solids, honey granules, green tea powder (5 %), sodium caseinate (a milk derivative), natural flavors, ground cinnamon, natural spice blend, emulsifier (mono- and diglycerides), stabilizer (dipotassium phosphate), emulsifier (soy lecithin). INGREDIENTS: cane sugar, coconut oil, corn syrup solids, honey granules, white tea powder (3 %), natural flavors, green tea powder (1 %), sodium caseinate (a milk derivative), emulsifier (mono- and diglycerides), natural spice blend, stabilizer (dipotassium phosphate), emulsifier (soy lecithin), black pepper (<1%).